Hello, dear readers! Today we have prepared for you a new drawing lesson – it is the universe of Mortal Kombat, and we will draw perhaps the most charismatic warrior – today we will show you how to draw Raiden. Originally, Raiden is the god of thunder in Japan, similar to Thor in Norse mythology. 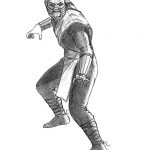 Raiden is familiar to fans of Mortal Kombat universe in the form of high man, dressed in white and blue robes, similar to that worn by samurai. 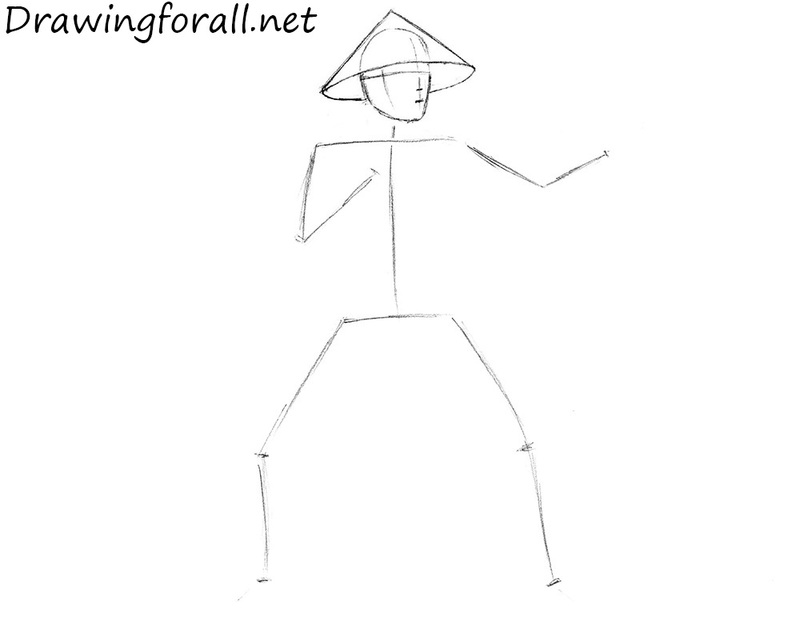 Exactly this Raiden we will draw! And the height of the body (from the waist to neck inclusive) – the height of the two heads. The head we outline in the shape of the oval. The torso, shoulders, hands and legs we sketch out using simple lines. Ok, now we go down below and give volume to the hands and upper body. 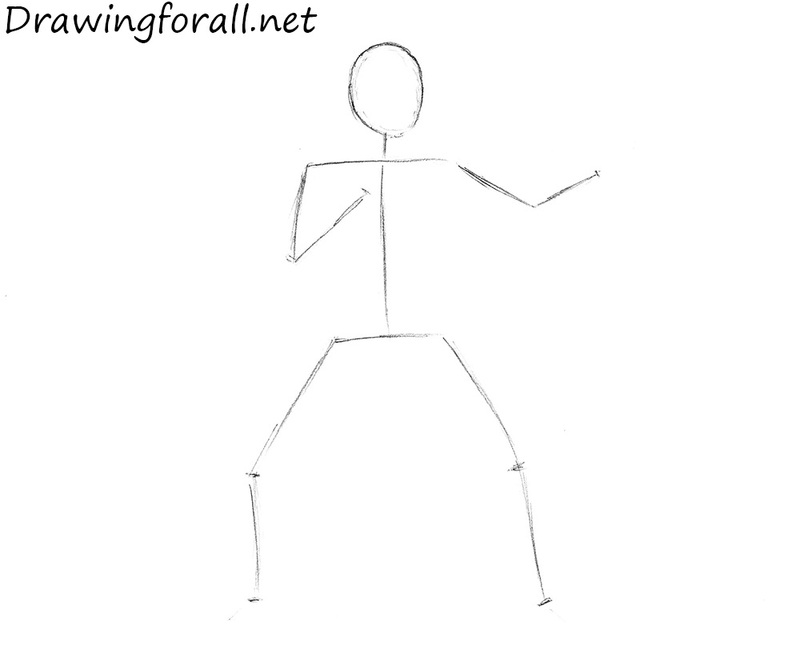 Draw the neck and arms in the form of cylinders. Outline the torso in the shape of big cylinder. Outline the elbows and fists. We perform the same job with the lower part of the trunk and legs. Using lines of the stickman draw the belt and groin in the shape of a triangle and the thighs in the form of massive cylinders. Give to the lower legs characteristic shapes of the knees and calf muscles, sketch out silhouettes of feet as in our sample and proceed to the next step. Let’s work a little on the silhouette of our mighty Raiden. Erase the extra guidelines of the previous steps from the upper body of Raiden. 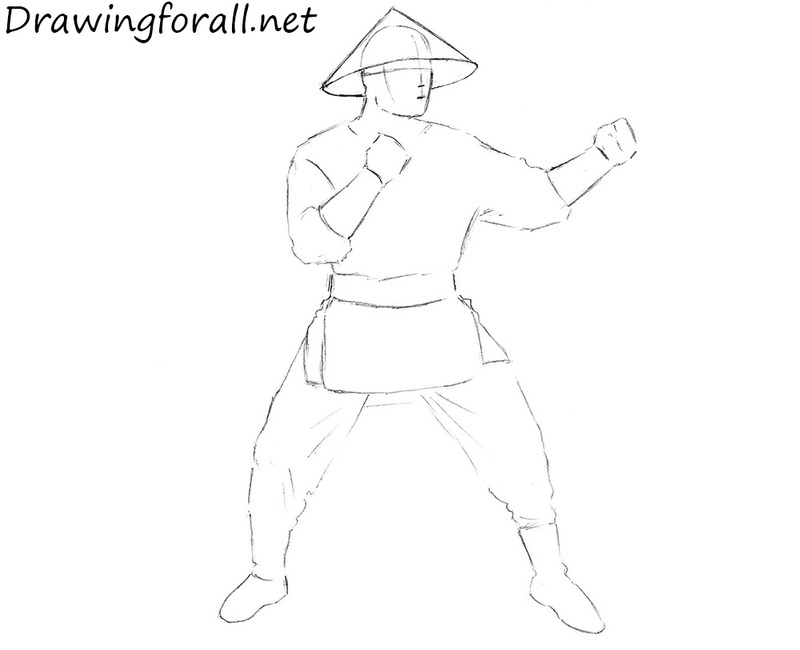 Outline the arms and clothing on arms. Outline the shapes of the wide sleeves, and tight bracers. Don’t forget to add some folds to the clothing. Now’s work on the lower part of the trunk and legs. To start, just as in the previous step, erase the guidelines. Then let’s give the effect of loose clothing dressed on his legs. 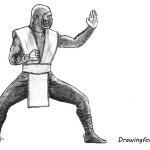 Draw the lower part of the vest (it is by the way called kataginu) and a belt, and then go back to the legs and using a few strokes outline just a few folds. Silhouette we have worked very well, that’s why get down, to add more details to the picture. Let’s start with the head – draw the face. As you can see, there is nothing difficult – almond-shaped eyes, arched eyebrows, short nose and a couple of lines of the mouth. Do not forget to draw the nasolabial folds, and the shadow of the hat. Also, draw a vertical line of fabric, which will be held from the hat to the lower jaw. 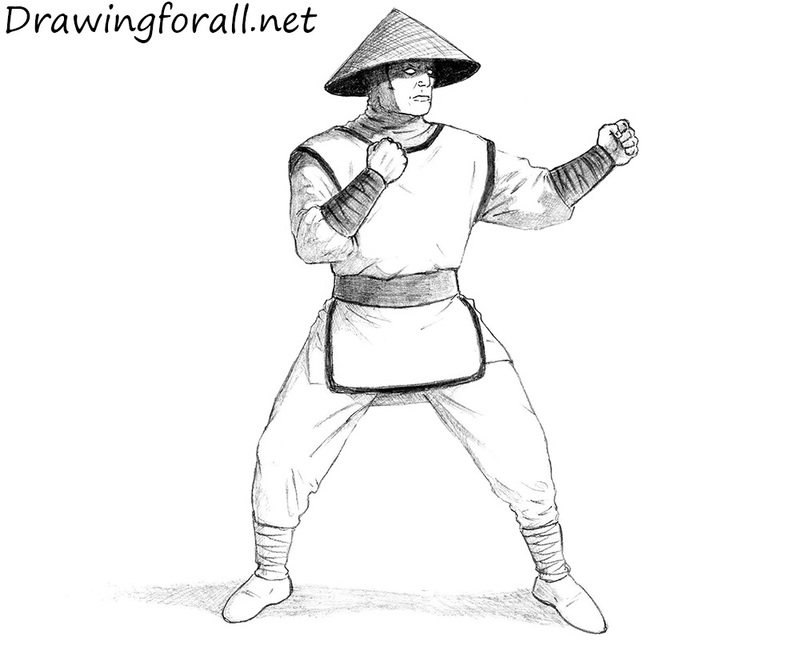 Cover headdress of Raiden using hatching crosswise. Draw folds on the clothing and add some details. 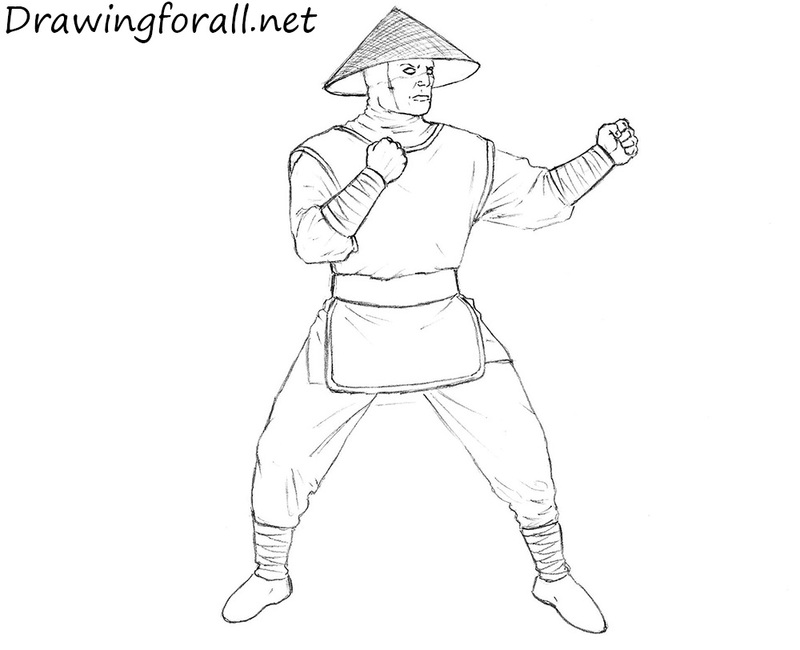 As you can see, folds cover only the lower part of the costume of Raiden – draw their using smooth lines in the area of the throat and neck and put a few extra wrinkles in the area from the shoulder to the elbow on both arms. 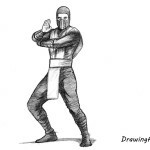 Draw strips of cloth on the forearms, indicate details on the kataginu. Draw the hands. 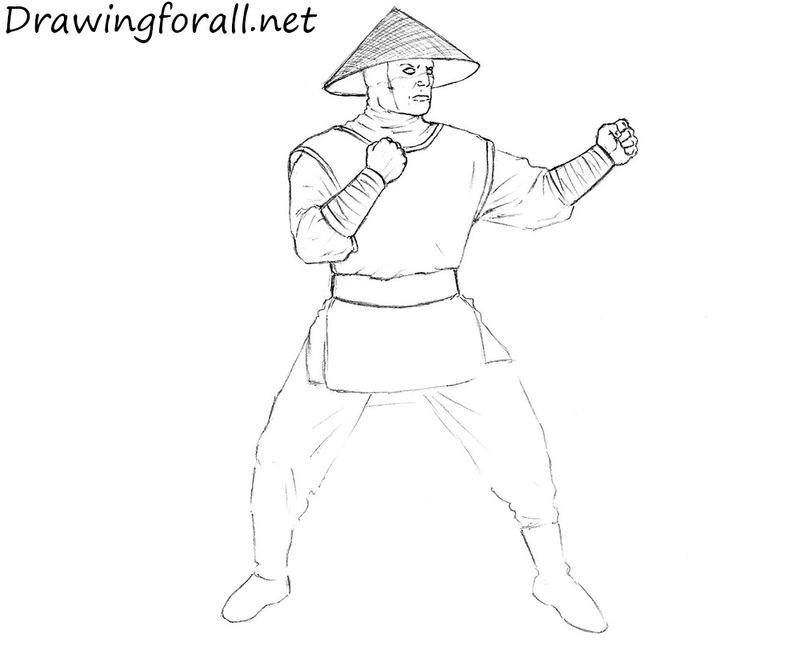 Raiden is almost ready, and it is the last step of the drawing lesson on how to draw Raiden from Mortal Kombat. Let’s start adding shadows. Define the light source – in our example the light comes from the upper right side of us. Using light hatching add shadows to the left part of the hat. Paint out the internal part of the hat. Add shadow from the hat to the upper part of the face, leaving the eyes unpainted, so they will look slightly illuminated. Then using light hatching add shadow to the neck and add shadow from the head, that falls on the shoulder. Now impose lighter shadows on the legs. The last step will be adding on a light shadow, which Raiden figure drops to the surface. That was a difficult lesson, but the result was worth it. 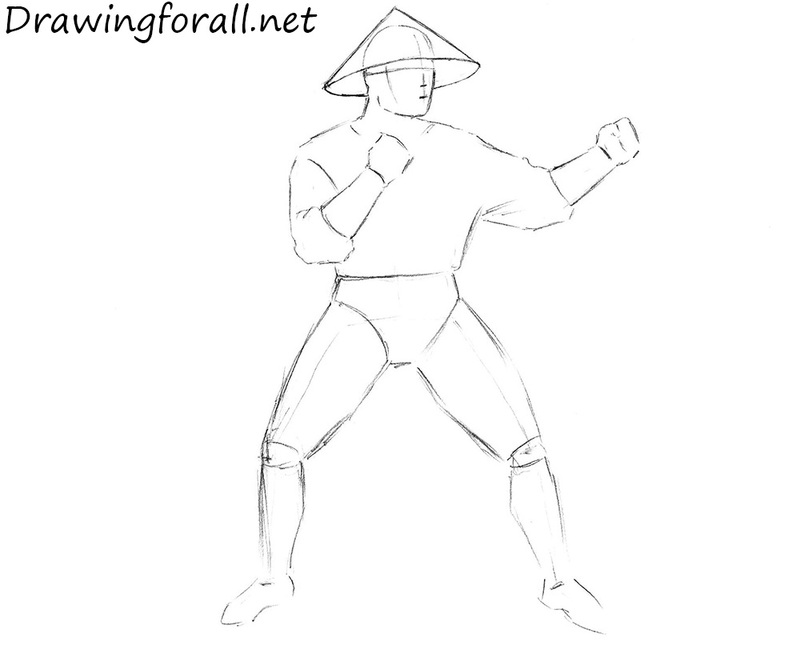 Come to Drawingforall.net for the new drawing lessons. All the best, see you on our site! Of course. 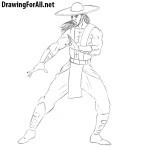 Soon we will draw Kung Lao.